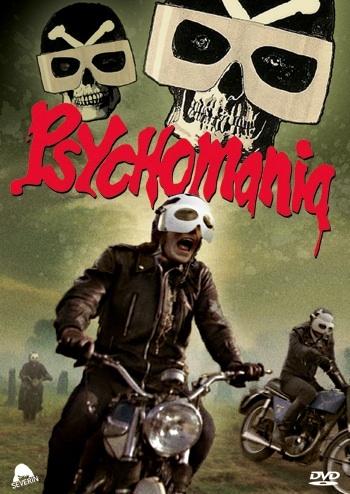 Schlock-Wire: A New Edition Of PSYCHOMANIA Revs Onto DVD In October, Courtesy Of Severin Films – Schlockmania! 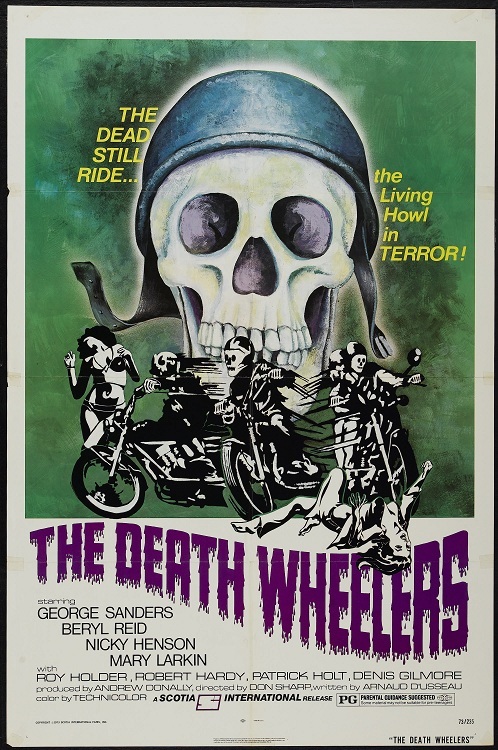 The grooviest zombie biker movie of them all is being exhumed and, after years of shoddy bootlegs and sub-par presentations, is getting the Special Edition treatment from Severin. Psychomania stars Beryl Reed (Beast In The Cellar) and, in his last performance, George Sanders (Village Of The Damned) who perfect a formula to return from the grave via some sort of satanic toad worship. Said formula is then used by young Tommy and his biker gang, The Living Dead, who after offing themselves in a variety of creative ways, free-wheel back from the dead to wreak havoc on a small English town. This uber-black British horror-comedy (which has one of the greatest and most original soundtracks of its era) was a staple of late night TV for years but has never been seen like this thanks to a stunning new high definition transfer. Recent interviews were shot in London with stars Nicky Henson, Mary Lar kin, Denis Gilmore, Roy Holder and Rocky Taylor, while soundtrack composer John Cameron (Kes, Jack The Ripper) and ‘Riding Free’ crooner Harvey Andrews not only reminisced but treated us to renditions of their otherworldly work on the film. Also on the extras slate is an intro from Fangoria editor in chief Chris Alexander. This will be yet another amazing Severin restoration that any fan of 70s horror should not be without. Coming soon in October!